Translation from Interface - Comunicação, Saúde, Educação, Botucatu, v.13, n.31, p. 409-422, Dez. 2009. Founded on practical rationality, this qualitative case study aimed to explore the teaching practice at university, focusing on teacher's reflections and competencies. To this end, teaching practices were described, analyzed, and interpreted. These interactions with students on a course in the pharmacy program, brought about situations involving dilemmas and learning opportunities for problem-solving and decision-making skills. Throughout the study, students were encouraged to use knowledge-in-action, reflection-in-action, and reflection-on-action, and these processes were also experienced by the teacher. Analysis of the records from classroom observation and the interviews with students and the teacher showed the fundamental role of such reflective processes, which led to attainment of the intended objectives. In this sense, the teacher's reflective practice was essential for supporting the application of each curricular component of the course. Key words: Teacher's practices. Reflective processes. Teacher's competencies. Case study. Com base na racionalidade prática, este estudo de caso qualitativo objetivou explorar a prática docente universitária, focalizando a reflexão e as competências do professor. Para tanto, foram descritas, analisadas e interpretadas as práticas que, na interação com os alunos em uma disciplina do curso de farmácia, criassem situações dilemáticas e oportunidades de aprendizagem das habilidades de solução de problemas e tomada de decisão. Ao longo do estudo, os alunos foram estimulados a utilizar os processos de conhecimento-na-ação, reflexão-na-ação e reflexão-sobre-a-ação, que também foram vivenciados pelo professor. A análise dos registros de observação em sala de aula e de entrevistas com alunos e o professor evidenciou a importância desses processos reflexivos, que nortearam a consecução dos objetivos pretendidos. Nesse sentido, a reflexão docente sobre a própria prática foi fundamental para subsidiar a aplicação de cada componente curricular da disciplina. Palavras chave: Práticas docentes. Processos reflexivos. Competências docentes. Estudo de caso. Basado en la racionalidad práctica, este estudio de caso cualitativo objetivó averiguar la práctica docente universitaria, centrado en la reflexión y en las competencias del profesor. Para eso, hemos descrito, analizado e interpretado las prácticas docentes que, en la interacción con los alumnos de farmacia, criasem situaciones dilemáticas y oportunidades de enseñanza de las habilidades de solución de problemas y decisiones. A lo largo del estudio, los alumnos fueram estimulados a utilizar procesos de conocimiento-en-la-acción, reflexión-en-la-acción y reflexión-sobre-la-acción, también vividos por el profesor. El análisis de los registros de observación en clase y de entrevistas con alumnos y el profesor evidenció la importancia de esos procesos reflexivos, cuya conducción llevaron a lograr los objetivos. En este sentido, la reflexión docente sobre la propia práctica fue fundamental para subsidiar la aplicación de cada componente curricular de la asignatura. Palabras clave: Prácticas docentes. Procesos reflexivos. Competencias docentes. Estudio de caso. The present study describes the essence of the research developed for the doctoral thesis of one of the authors (Costa). Since the theoretical reference point used was reflective teaching practice, the text firstly presents remarks regarding the theory to illustrate the concepts worked on, and to place this study in its context. The study was developed within the scenario of higher education. Thus, the text starts with a comparison between technical rationality and practical rationality and describes what reflective practice is. The reflective processes are then presented, followed by a brief description of the postmodern scenario and its characteristics, which have brought new tasks and responsibilities for teachers. At the end of the introduction, reflective practices and teaching competencies are characterized. After introductory remarks, the text then presents the results from an investigative study: objectives, methodology, results, discussion and final remarks. Modern higher-level education is sustained by positivist roots, in an epistemological form named technical rationality (Schön, 1983). This vision constitutes the basis for the traditional culture of university teachers. From this point of view, there is a clear separation between theory and practice: only after contact with scientifically proven truths (the so-called core facts) are students capable of applying the acquired knowledge (Pedroso and Cunha, 2008). In investigating the relationship between types of knowledge that are respected in universities and types of competency that are valued in professional practice, Schön (1983) demonstrated that university institutions are committed to technical rationality, whereas professional practice requires a new epistemological form of practice: practical rationality. This is based on action and reflection together, in a process named reflective practice (Kinsella, 2006). Through practical rationality, learning that does not disconnect reason (theory/knowledge) from action (practice) is proposed. This shows the importance of reflection within education. In this manner, in addition to theoretical knowledge, there is also knowledge that originates from practice itself, and this knowledge may be useful for reinventing wisdom, creating new techniques and reassessing practices (Alarcão, 1996). Therefore, there is constructivist value in practice, and this can be used to modify or improve the rules and processes evaluated by science (technical rationality). According to Schön (1983, 1987), reflective practice is centered on three processes: knowledge-in-action, reflection-in-action and reflection-on-action. Knowledge-in-action is a type of knowledge that is not derived from any intellectual operation and is embedded within the action itself. Reflection-in-action is triggered in situations of doubt, when unexpected situations are encountered. Subsequently, after the action has been completed, it is possible to think about what happened and how the action was undertaken, in an evaluative process named reflection-on-action. According to Schön, the focus is on professional practice, i.e. the ways in which professionals act in real situations and how they can be helped to develop their reflective processes through action by an educator: coaching. Within the context of the present study, the coaching system used by Schön for studying these processes (in general, one tutor per student) was adapted to Brazilian realities: the university teacher faced with a classroom of dozens of students (Faria, 2003; Cunha et al., 2001; Mezzaroba, 2000; Rozendo et al., 1999). Therefore, the focus was on the practices of university teachers, and the way in which their reflective processes influenced the curriculum structure and teaching in the classroom. Over the last four decades of the 20th century, modern or industrial society witnessed the gradual appearance of so-called post-industrial, postmodern or information-based society. The availability of knowledge through the internet (Abreu and Nicolaci-da-Costa, 2003), together with the speed of information renewal in the postmodern era, has challenged the universality of knowledge that is postulated through positivist ideas. Thus, real problems increasingly present new, interactive, uncertain, polemical and polysemic characteristics, including in the field of pharmacy (Chaud, Gremião and Freitas, 2004), which is the focus of the present study. This picture contrasts with the curriculum structure prevailing in universities (Lima, Castro and Carvalho, 2000), insofar as the latter compartmentalizes and crystallizes knowledge into disciplines. Therefore, the situations that students will face make it imperative to learn how to adapt to new contexts (Ketzer, 2007; Tavares and Alarcão, 2001) and, consequently, how to structure and put in context problematic situations. In this way, there will be a greater possibility of clarifying the objectives to be achieved and selecting, from among the diversity of means, the most appropriate one for meeting these objectives. In this light, teachers are tasked not only with transferring material content but also, especially, with providing their students with the skills to use and link knowledge, thus selecting and applying it correctly in order to solve the problem that is presented. Knowing how to solve problems is just one of the essential characteristics for entering the current job market, which also requires people who know how to communicate, make decisions and work in groups (Petit, Foriers and Rombaut, 2008a, 2008b). For students to attain these objectives, which requires them to develop complex capacities, such as problem-solving and acting in cooperation with other people, teachers need to develop competencies that allow them to plan and successfully apply the curriculum components. For example, this includes clearly defining the objectives, the material content to be explored and what should be excluded, and the methodological and evaluative strategies (Zabalza, 2004; Zabalza, 1998). For this, it is fundamental to maintain attitudes and habits of reflecting on classroom practice. One of the main themes in postmodern education is reflective education (Sockman and Sharma, 2008; Cronin and Connolly, 2007; Gomes and Casagrande, 2002; Pereira, 1998), which places value on teaching practices that stimulate reflection by teachers themselves and by their students. Nonstop production of new information requires teachers and students to develop critical awareness (Freire, 1997) and learn to think and reflect on what has been learned and what has been done in practice. The reflective processes of knowledge-in-action, reflection-in-action and reflection-on-action are manifested by teachers (or tutors, as they were called by Schön, 1983) and by students, and they can be stimulated through facing situations of dilemmas. In the view of Zabalza (1994, p.61), dilemmas are "the entire set of bipolar or multipolar situations that are presented to teachers over the course of their professional activities". Such situations can be either bipolar or multipolar because, in the first case, a dilemma may present two clearly opposite choices, and in the second case, it may have a range of alternatives. Therefore, in day-to-day classroom activities, dilemmas are concrete situations characterized by a need for immediate decisions in unpredictable contexts like those of the classroom. To accomplish reflective teaching, teachers need to have a set of knowledge and attitudes, such as an open mind, intellectual responsibility and enthusiasm (Marcelo García, 1992). They should also respect students' knowledge, accept new things, reject discrimination of any type, be humble and tolerant and demonstrate professional competency and commitment (Freire, 1997). Competency is a polysemic term that is difficult to define (Lima, 2005; Perrenoud, 2001; Rios, 1999). However, there is a certain degree of consensus among authors that this term involves correct mobilization of cognitive, affective and, sometimes, psychomotor characteristics (Perrenoud, 2002). In this respect, Masetto (2003) indicated certain competencies that were considered to be specific for university teachers: i) up-to-date mastery of basic knowledge (through research) and practical experience within their field of activity; ii) mastery of various aspects of pedagogy; and iii) practice of teaching as a citizen and politician. Reflective practices constitute prerequisites for university teachers to be able to develop certain competencies for (re)thinking the curriculum components of a discipline, thereby stimulating reflective processes in students and feeding their disposition to (re)evaluate their objectives, which will guide the other curriculum components. Thus, it can be understood that reflective practice avoids accommodation and stimulates frequent refinement of teaching activities. Nevertheless, some authors (Luz, 2008; Pimenta, 2002; Valadares, 2002; Campos and Pessoa, 1998) have criticized Donald Schön's theory of reflective practice, especially regarding the concept of "reflective teachers", as follows: i) Schön considered that reflection was an individual process (without taking into account reflections as collective activities); ii) as a corollary of the preceding criticism, Schön did not expand his theory to institutional conditions, and thus included little exploration of the social context of reflective activities; and iii) there was no discussion of the role of teachers' theory training. The criticisms that have been pointed out are pertinent but, nonetheless, Schön's ideas regarding teaching have not lost their value. Oral and written reports on reflection-in-action and reflection-on-action are important for improving classroom practice, and they also enrich the production and dissemination of research. Furthermore, collective reflection among teachers is a question of habit and training in exchanging experiences through meetings, which may be the starting point for institutional changes. In addition, the issue of theory in teacher training is an integral part of the curriculum and focuses on aspects of the teacher-student relationship for teaching and learning. This investigation explored teachers' actions through studying the role of reflection and the competencies needed for turning the curriculum of an academic discipline into a means for improving students' learning. More concretely, this study sought to describe the teaching practices and reflective processes associated with these practices that would strengthen the competencies needed for university teachers to delineate the curriculum structure from the teaching objectives, with the aim of maximizing their students' learning opportunities. Given that the current requirements for teaching positions have kept on increasing (Vasconcellos, Oliveira and Berbel, 2006), focusing on differentiated teaching practices may enrich the discussion on better-quality university teaching. Thus, the aim of this study was to contribute towards reflections on the way in which teachers act in classrooms, through examining the reflective processes and competencies that guide teaching practices. A qualitative case study strategy was used in this investigation (Bogdan and Biklen, 1994; Lüdke and André, 1986). This approach was chosen because it would supply data that would generate interpretations of greater significance than would the data obtained from quantitative studies. The latter would, for example, indicate good or poor performance, but would be incapable of providing interpretations that might reveal reasons for success or failure. Given the proposed objectives, a teacher who would present indications of differentiated teaching practice was selected. The selection was made based on a meeting on teaching experiences that took place in a public university, within the pharmacy course. At this event, several teachers presented innovative actions that aimed to improve teaching and students' learning. Thus, it was possible to contact disciplines that valued reflection and critical thinking. After selecting the teacher, his practices were described, analyzed and interpreted, In interactions with his students, this teacher was in the habit of creating situations involving dilemmas and opportunities for training in problem-solving and careful decision-making, by means of recording and observing the reflective processes of knowledge-in-action, reflection-n-action and reflection-on-action, which took place over the course of the activities that were monitored. The teacher selected was giving classes in a professional training discipline to the penultimate year of the undergraduate pharmacy course. The data-gathering methods used were observation, document analysis and interview. The data gathering began with observations in the classroom between August and October 2000, totaling around 45 hours of observations. On all the days observed, the concrete ways in which activities were performed by the students were ascertained, and the activities that the teacher proposed and which could stimulate reflection were recorded. During the observation period, the students and the teacher were aware that the observer was monitoring the classes, but would not become involved in the activities (Minayo, 1999), in order that the observer would remain free to make written records. The study subjects were the teacher of the discipline and the 32 students enrolled in the discipline. The document analysis consisted of examining the initial assessment questionnaires and a test-based exercise that the teacher proposed, for the students to gain some knowledge of what the final assessment would be like. Semi-structured interviews were conducted with the teacher of the discipline and with three students. The students were selected based on information supplied by their colleagues, of the type "he's a good student", and also based on classroom observations, to gain a perception of whether such students would be consistent sources of information. Selecting three individuals out of a total of 32 students is coherent with the qualitative approach, since this does not following sampling logic, which would be inadequate for covering all the relevant variables for the case under examination (Yin, 1994). Thus, the number of interviewees was compensated qualitatively by drawing up a list of questions that enabled in-depth responses because they were open questions. The interview question list was drawn up to seek information from the students regarding teaching practices that made reflection easier or more difficult. The teacher was asked to provide the same information with the aim of data triangulation. The interviews were recorded on cassette tape and subsequently transcribed and confirmed by the subjects, to whom anonymity was guaranteed. In the thematic analysis on the data (Minayo, 1999), the first step was to read the observation reports and interview transcripts in depth. Following this, selection of significant passages and creation of codes were started. These codes were drawn up based on the features that drew most attention over the course of the classroom observation, particularly the teaching techniques used and the dynamics of the students' and teacher's reflective processes. 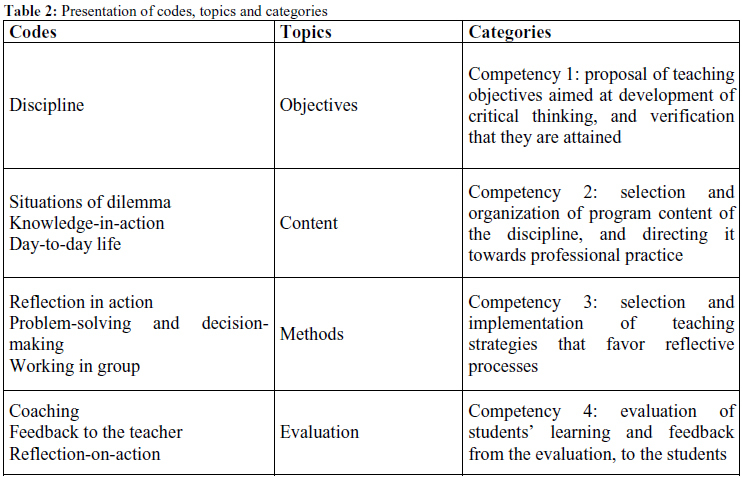 After the codes had been established (see Table 1), the next step was to group similar codes as topics (corresponding to curriculum components of the discipline) and then as categories (see Table 2), in order to then proceed with data interpretation in the light of the theoretical framework adopted, i.e. reflective education. Although significant data were generated, the case study approach presents certain limitations. Some authors (Stake, 1995; Walker, 1988; Miles, 1979) have indicated that it has disadvantages such as the enormous cost in terms of time, money and personal effort. Furthermore, the ethical risks associated with qualitative research on education are considerable, since it involves people and thus always places privacy at risk. Traditionally, the positivists have indicated that there is a lack of rigor in such research, along with unpreparedness among researchers and subjective influences. However, these are fallacious and refutable arguments. The greatest concern in educational research is precisely the rigor relating to preparing and conducting the study, in order to maximize the validity of the conclusions. It should also be noted that subjectivity has been recognized as having a role of value: differing from common sense, it can be directed and seated in a rigorous attitude towards the research (Lüdke and André, 1986). The reflective processes and teaching practices were analyzed and discussed in conjunction with the teaching competencies that were highlighted. In this manner, strategies that would provide the conditions for developing reflective processes among the students were planned and, at the same time, data that enabled inferences about the teacher's reflections were obtained. In relation to the teaching objectives, the teacher affirmed that the discipline is a tool for: i) stimulation of reasoning and development of communication of ideas (oral and written); ii) practice of working in groups; iii) practice of social and citizen's roles as a professional; and selection of a problem and its context and proposal of possible solutions. I think the aim is to show to students that there is a reality that they can [...] be part of, including as professionals, to modify and improve the environment. [...] their knowledge can turn them into transformers [...] people who need to have a solid opinion about a given subject, which will have an influence on public opinion, yes. I'd like to imagine that they will be in a position to be deciding things, working on decision-making processes to participate in municipal policies in the city where they come from or where they live. I think this is extremely important (Interview with teacher). The teacher was concerned about the issue of scientific truth and the determinist manner in which information is transmitted. The greatest role of the discipline is to make students think (using the knowledge gained from basic disciplines) and reflect about scientific knowledge as something provisional and definitive. In his view, students coming from the university at which he was giving this course need to adopt an active stance, be opinion formers (Saupe et al., 2005) and know how to position themselves securely in relation to polemical issues, such as transgenic food, breakage or registration of patents etc. For this reason, students need to develop the capacity to think and demonstrate a critical sense: an ability for which there is little training in traditional school life. The objectives raised by the teacher are significant, since they reveal a concern for learning through proposing reflection exercises and practical situations that simulate the reality of professional life that students will face. For this reason, some situations were created (Table 1, code 2) that would stimulate students to think about their future professional action: working in groups and stimulation for reflection through solving specific problems that simulated possible real situations, such as in discussing and solving test questions and in compiling a proposal based on financial support for a project relating to fermentation processes, directed towards the future mayor (in the year 2000, the time of data gathering for this study, there were elections for the mayor and city councilors). In this category, establishment of bridges between the material content of the discipline and the professional world was highlighted. Thus, the teacher created situations that linked the material content presented with the realities of the profession (Table 1, code 4). For example, issues relating to patients and culturing of microorganisms, etc., were discussed. Day-to-day situations were used to illustrate the professional world (mega-mergers of food and pharmaceutical companies, microbe biodiversity and fermentation products). It was noticeable that the teacher was successful in transforming a technical subject (fermentation) into an agreeable and accessible topic for the students. What makes this even more surprising is that in Brazil, the pharmaceutical profession itself is still essentially technical in nature. 16:26 hours - The teacher circulated a small box among the students, containing fermentation products (moldy bread and cheese) and showed a set of substances and products (vinegar, wine, fructose, antibiotics, amino acids, vitamins, shampoos, Aji-no-motoÒ, DanoneÒ, OmoÒ, etc.) with a relationship with some form of fermentation and pharmaceutical technology (Aug 14, 2000 - classroom observation). 17:07 hours - O teacher showed a newspaper report (O Estado de São Paulo, June 27, 2000) about the purchase of NabiscoÒ by Philip MorrisÒ. Through this acquisition, Philip MorrisÒ became the second biggest food manufacturer in the world (the biggest is NestléÒ) (Aug 28, 2000 - classroom observation). The main problem in our region in relation to effluent treatment is the vinasse, which today is under better control but used to leave a horrible smell in the air (Sep 5, 2000 - classroom observation). 16:39 hours - [In the evaluation]... there will be four problems that involve the topics we have visited. The problems may be interlinked, and the subjects may encompass data from other disciplines. [The teacher] emphasized that it was not for the students to get hold of old exercise books and study, but only to train themselves to look outwards: to other disciplines and the place where they lived, outside of the school (Sep 25, 2000 - classroom observation). Here, it was shown which strategies or teaching methods were used and, fundamentally, how the teacher used these strategies. One widely used strategy was to form opposing groups to defend conflicting points of view, in polemical subjects like the right (or lack of right) to patent new species of microorganisms. For example, the teacher tried to form opposing groups within the class, by asking about students' position in relation to a topic and asking them to justify their choice (Table 1, codes 3, 5 and 6). This strategy made it possible to improve their knowledge-in-action and learn to reflect-in-action, as well as providing training on decision-making. Some situations that stimulated the students to work in groups were also created (Table 1, code 7), as well as proposals for exercises that placed value on the capacity for written expression, which is a fundamental ability in professional training for any field of knowledge. In proposing activities for training in writing, the teacher stimulated the students' capacity to reflect-on-action. It needs to be emphasized that this process of reflection-on-action is not merely a memory exercise, but involves the intellectual operation of recollection with a purpose, which is to assess how the action was carried out and the way in which it could be improved next time (Table 1, code 10). In the practical class, what we discussed most was how to do what he [the teacher] was proposing... Because he didn't say Do it this way', he said You have to do this; you'll discover how'. So, straightaway, everyone started to discuss what had to be done and how. Why it shouldn't be done one way but another way. Well, there was a whole series of questions and decisions to make... which I think was very important... Because this is how we are going to have to work from now on (Interview with a student). The teacher's concern about not providing ready answers or recipes that would be valid in any situation (Masetto, 2004) but, rather, to stimulate exchanges of ideas between the students, so as to make them autonomous learners and independent thinkers, was evident. In this category, the teacher's role of knowing the target public's characteristics and adapting the teaching practices to these characteristics was highlighted. From this point of view, the teacher took an ethical stance in that he respected and took into consideration individual differences between the students and sought to frame his evaluation based on this context, thereby placing value on each student's learning style. This teaching behavior contrasts directly with the technical rationality model, which denies the notion that students have different life histories. The model maintains that they experience, develop and incorporate their experiences, cultures and talents in a single manner. 3- You will already have heard about biotechnology through talks, speeches and various means of communication. Define biotechnology and describe its importance for humanity. / 5- You will soon be graduating as a pharmacist. What knowledge do you expect to acquire through the discipline of [name of this teacher's discipline] that might contribute towards your graduation? (Aug 14, 2000 - classroom observation/initial questionnaire). The classes generally aroused a critical spirit. The teacher really liked to provoke our attention... But what aroused a critical spirit most for me was the test: an intelligent test, a difficult one; it wasn't at all easy... but it was a test that greatly aroused a critical spirit and made the students discuss it with each other: what it was all about, the process, everything... This type of test was very advantageous; I liked it a lot. In my opinion, this was the best part of the material (interview with a student). The teacher said that it was impossible to ignore individual differences in small classes [he stressed that in large classes, it is much more difficult to give individual attention] (Aug 22, 2000 - classroom observation). The teacher said that he deliberately let the students talk, provided that each of them handed in his own responses. He knew that they would call on him to answer their queries. In this way, he identified each student's weak points and was then, later on, able to provide reinforcement for those who still did not understand the subject Aug 28, 2000 - classroom observation). I think that you're the one who has to create the experience. To decide how you are going to deal with a student who is used to being intelligent and having good marks, that is, he's intelligent in good marks. So you need to know what type of challenge he's going to make, or whether he will make any, or whether he will hide away; who he is. There's not much time for you to delve into this: as soon as clap eyes on a student, you have to know what kind of gem he is; you have to know right away, there's not much time. Firstly, you have to consider each of them to be a gem [...] you have to dig into them quickly; you have to find something to identify them, and this has to be something you feel in your skin, you know. Well, with time, you end up learning to do this. I think this is the great challenge (interview with the teacher). In the teacher's view, the material content acquires a secondary nature (Pedroso and Cunha, 2008) and can vary according to how higher objectives are developed: "It's not a repetitive thing: every year is something completely new and different. For this reason, I'd say that the material content doesn't matter much: you're working on other factors" (interview with the teacher). This study had the aim of exploring a case of differentiated teaching practice that highlighted the role of reflection and the competencies needed for university teachers to (re)think the curriculum organization for a discipline, in such a way as to maximize the opportunities for the students to learn how to solve problems and make decisions. At different times, the results showed that the processes of reflection-in-action and reflection-on-action had fundamental roles, stimulated (and experienced) by the teacher. These made it possible to direct the curriculum towards achieving the intended objectives. In this respect, the work developed by Pedroso and Cunha (2008) in relation to a nutrition course needs to be highlighted. Their report on innovative teaching experiences brought out valuable information that reinforces many of the conclusions from the present study. As discussed earlier, a crisis of paradigms is being experienced today within higher education (Masetto, 2004). Modern assumptions relating to stability of knowledge and the world of work have appeared and the perspectives for teacher training and action have changed (Pedroso and Cunha, 2008; Chaud, Gremião and Freitas, 2004; Tavares and Alarcão, 2001). Within this context of instability, individuals' reflections on their own practices form a fundamental condition for departing from the sphere of certainties provided by third parties to attain other levels (Zabalza, 1994), through considering reasoned decision-making, creative debate, learning that values mistakes and doubts (Ketzer, 2007), and the courage to propose new solutions. The best teachers are more aware of their practices, and this level of awareness depends on reflection on the complex process of teaching. 6) Teaching practice coherent with practical rationality: emphasis on the importance of theory linked to practice, and never dissociated from it; action supported and fed by theory, which is the essence of true praxis (action-reflection-action continuum). Given the complexity of teaching practice characteristics and their likely impact on students' personal and professional training, it is hoped that this study will contribute towards placing value on teaching practices that result in better learning conditions for students. ABREU, R.A.S. ; NICOLACI-DA-COSTA, A.M. Internet: um novo desafio para os educadores. Cad. Psicol. Educ. Paidéia, v. 13, n. 25, p.27-40, 2003. ALARCÃO, I. Reflexão crítica sobre o pensamento de D. Schön e os programas de formação de professores. In: ______ (Org.). Formação reflexiva de professores: estratégias de supervisão. Porto, PT: Ed. Porto, 1996. p.9-39. BOGDAN, R.C. ; BIKLEN, S.K. Investigação qualitativa em educação: uma introdução à teoria e aos métodos. Porto, PT: Ed. Porto, 1994. CAMPOS, S.; PESSOA, V.I.F. Discutindo a formação de professoras e de professores com Donald Schön. In: GERALDI, C.M.G. ; FIORENTINI, D.; PEREIRA, E.M.A. (Orgs.). Cartografias do trabalho docente: professor(a)-pesquisador(a). Campinas, SP: Mercado de Letras, 1998. p.183-206. CHAUD, M.V. ; GREMIÃO, M.P.D. ; FREITAS, O. Reflexão sobre o ensino farmacêutico. Rev. Ciênc. Farm., v. 25, n. 1, p.65-8, 2004. CRONIN, M.; CONNOLLY, C. Exploring the use of experiential learning workshops and reflective practice within professional practice development for post-graduate health promotion students. Health Educ. J., v. 66, n. 3, p.286-303, 2007. CUNHA, M.I. et al. Inovações pedagógicas na formação inicial de professores. In: FERNANDES, C.M.B. ; GRILLO, M. (Orgs.). Educação superior: travessias e atravessamentos. Canoas: Ed. Ulbra, 2001. p.33-90. FARIA, J.I.L. Prática docente reflexiva na disciplina de Administração em Enfermagem Hospitalar: uma experiência de desenvolvimento profissional de professores-pesquisadores. Tese (Doutorado) - Escola de Enfermagem de Ribeirão Preto, Universidade de São Paulo, Ribeirão Preto. 2003. FREIRE, P. Pedagogia da autonomia: saberes necessários à prática educativa. Rio de Janeiro: Paz e Terra, 1997. GIROUX, H.A. Superando objetivos behavioristas e humanísticos. In: ______. Os professores como intelectuais: rumo a uma pedagogia crítica da aprendizagem. Porto Alegre: ArtMed, 1997. p.79-90. GOMES, J.B.; CASAGRANDE, L.D.R. A educação reflexiva na pós-modernidade: uma revisão bibliográfica. Rev. Latinoam. Enferm., v. 10, n. 5, p.696-703, 2002. KETZER, S.M. A graduação e os desafios da formação do educador do século XXI. Educação, v. 30, n. especial, p.35-45, 2007. KINSELLA, E.A. Constructivist underpinnings in Donald Schon's theory of reflective practice: echoes of Nelson Goodman. Reflective Practice, v. 7, n. 3, p.277-86, 2006. LIMA, P.G. ; CASTRO, F.; CARVALHO, M.A.V. Caminhos da universidade rumo ao século XXI: pontos e estratégias para a sua orientação na visão de educadores brasileiros. Cad. Psicol. Educ. Paidéia, v. 10, n. 18, p.8-27, 2000. LIMA, V.V. Competência: distintas abordagens e implicações na formação de profissionais de saúde. Interface - Comunic., Saúde, Educ., v. 9, n. 17, p.369-79, 2005. LÜDKE, M.; ANDRÉ, M.E.D.A. Pesquisa em educação: abordagens qualitativas. São Paulo: EPU, 1986. LUZ, A.S. Discutindo o professor reflexivo no discurso oficial. VII Seminário Redestrado - Nuevas Regulaciones en América Latina. Buenos Aires, julho de 2008. Disponível em : <http://74.125.95.132/search?q=cache:C5gWY3CvhQEJ:www.fae.ufmg.br/estrado/cdrom_seminario_2008/textos/trabajos/DISCUTINDO%2520O%2520PROFESSOR%2520REFLEXIVO%2520NO%2520DISCURSO%2520OFICIAL.pdf+luz+%22professor+reflexivo%22+%22discurso+oficial%22&hl=pt-BR&ct=clnk&cd=1&gl=br&lr=lang_pt>. Acesso em: 21 fev. 2009. MARCELO GARCÍA, C. A formação de professores: novas perspectivas baseadas na investigação sobre o pensamento do professor. In: NÓVOA, A. (Coord.) Os professores e a sua formação. Lisboa: Dom Quixote, 1992. p.51-76. MASETTO, M.T. Inovação na educação superior. Interface - Comunic., Saúde, Educ., v. 8, n. 14, p.197-202, 2004. ______. Professor universitário: um profissional da educação na atividade docente. In: MASETTO, M.T. (Org.). Docência na universidade. Campinas: Papirus, 2003. p.9-26. MEZZAROBA, L. Concepções de avaliação de professores e alunos de Farmácia e Bioquímica da Universidade Estadual de Londrina, Paraná. Rev. Bras. Educ. Méd., v. 24, n. 3, p.53-61, 2000. MILES, M.B. Qualitative data as an attractive nuisance: the problem of analysis. Adm. Sci. Q., v. 24, n. 4, p.590-601, 1979. MINAYO, M.C.S. O desafio do conhecimento: pesquisa qualitativa em saúde. São Paulo/Rio de Janeiro: Hucitec/Abrasco, 1999. PEDROSO, M.B. ; CUNHA, M.I. Vivendo a inovação: as experiências no curso de nutrição. Interface - Comunic., Saúde, Educ., v. 12, n. 24, p.141-52, 2008. PEREIRA, E.M.A. Professor como pesquisador: o enfoque da pesquisa-ação na prática docente. In: GERALDI, C.M.G. ; FIORENTINI, D.; PEREIRA, E.M.A. (Orgs.). Cartografias do trabalho docente: professor(a)-pesquisador(a). Campinas, SP: Mercado de Letras, 1998. p.153-81. PERRENOUD, P. A formação dos professores no século XXI. In: PERRENOUD, P. et al. As competências para ensinar no século XXI: a formação dos professores e o desafio da avaliação. Porto Alegre: ArtMed, 2002. p.11-33. ______. Ensinar: agir na urgência, decidir na incerteza. 2. ed. Porto Alegre: ArtMed, 2001. PETIT, P.; FORIERS, A.; ROMBAUT, B. The introduction of new teaching methods in pharmacy education-I. Lessons learned from history. Pharmacy Education, v. 8, n. 1, p.13-8, 2008a. ______. The introduction of new teaching methods in pharmacy education-II. The starting point. Pharmacy Education, v. 8, n. 1, p.19-28, 2008b. PIMENTA, S.G. Professor reflexivo: construindo uma crítica. In: PIMENTA, S.G.; GHEDIN, E. (Orgs.). Professor reflexivo no Brasil: gênese e crítica de um conceito. São Paulo: Cortez, 2002. p.17-52. RIOS, T.A. Ética e competência. 8. ed. São Paulo: Cortez, 1999. ROZENDO, C. et al. Uma análise das práticas docentes de professores universitários da área da Saúde. Rev. Latinoam. Enferm., v. 7, n. 2, p.15-23, 1999. SAUPE, R. et al. Competência dos profissionais da saúde para o trabalho interdisciplinar. Interface - Comunic., Saúde, Educ., v. 9, n. 18, p.521-36, 2005. SCHÖN, D.A. Educating the reflective practitioner: toward a new design for teaching and learning in the professions. San Francisco: Jossey-Bass, 1987. ______. The reflective practitioner: how professionals think in action. New York: Basic Books, 1983. SOCKMAN, B.R. ; SHARMA, P. Struggling toward a transformative model of instruction: it's not so easy! Teaching and Teacher Educ., v. 24, n. 4, p.1070-82, 2008. STAKE, R.E. The art of case study research. New York: SAGE, 1995. TAVARES, J.; ALARCÃO, I. Paradigmas de formação e investigação no ensino superior para o terceiro milênio. In: ALARCÃO, I. (Org.). Escola reflexiva e nova racionalidade. Porto Alegre: ArtMed, 2001. p.97-114. VALADARES, J.M. O professor diante do espelho: reflexões sobre o conceito de professor reflexivo. In: PIMENTA, S.G.; GHEDIN, E. (Orgs.). Professor reflexivo no Brasil: gênese e crítica de um conceito. São Paulo: Cortez, 2002. p.187-200. VASCONCELLOS, M.M.M. ; OLIVEIRA, C.C. ; BERBEL, N.A.N. O professor e a boa prática avaliativa no ensino superior na perspectiva de estudantes. Interface - Comunic., Saúde, Educ., v. 10, n. 20, p.443-56, 2006. WALKER, R. Three good reasons for not doing case studies in curriculum research. In: New directions in educational evaluation, p.103-116, 1988. YIN, R.K. Case study research: design and methods. 2nd ed. Newbury Park, CA: Sage, 1994. ZABALZA, M.A. O ensino universitário: seu cenário e seus protagonistas. Porto Alegre: Artmed, 2004. ______. Diários de Aula. Porto: Ed. Porto, 1994. * This study is the result from the doctoral thesis of Caetano da Costa, under supervision by Lisete D. R. Casagrande. It had scientific and financial support from Fapesp and was approved by the Ethics Committee of the School at which it was conducted. The authors worked together at all stages of producing the manuscript. There were no conflicts of interest. i Address: Avenida José Herbert Faleiros, 600, casa 20, CEP 14098-780, Ribeirão Preto-SP. Brasil.